I’ve gotten a few questions about the differences between Sativa vs. Indica, and THC vs. CBD. Sativa and Indica refer to the two different types of marijuana. Marijuana comes in two varieties; sativa or indica, and the plants even look different (see below). Leaf Science has a great article called Indica vs. Sativa: Understanding the Differences, that goes into the history of the plant and the roots of their names. Sativa is on the left, and Indica is on the right. THC and CBD stand for tetrahydrocannabinol and cannabidiol, referring to the two most well-known of the group of chemicals that are found in cannabis that make up its medicinal properties. So, Sativa and Indica are the two types of marijuana. THC and CBD are two of the chemicals that make up both types of marijuana. All marijuana has some THC and CBD. THC is arousing, will make your heart rate speed up, is what gives you the munchies, and is what will make you high. It’s a psychoactive chemical that is responsible for the typical “stoner” behavior most people associate with pot use. CBD is calming, and has no psychoactive qualities. In fact, it can counteract the effect of THC. Should I care more about whether something is Sativa or Indica, or the ratio of THC to CBD? My answer? I care more about the ratio of THC to CBD. I want a very high CBD variety. Whether it’s Sativa or Indica isn’t important. When I began exploring medical marijuana, I was starting with very limited experience. I’d had two smoking experiences, (one in 1994 and one in 2000), and the latter was a very bad trip. I thought weed made you high, made you euphoric and giddy and silly, and made you want to eat your weight in Twinkies. After that one bad trip fifteen years ago (the last time I’d smoked up until very recently), I was told, “THC just does that to some people”. During that trip, I had terrible anxiety, and a very elevated heart rate (started at 165 or so, came down to 145 and stayed there for 2-3 hours). A few weeks ago, when I began walking into dispensaries asking for advice, I was told, “If you get anxious, you want Indicas. Indicas are more relaxing and will make you mellow, whereas the Sativas can be more stimulating.” (It’s worth noting that while you’ll hear this everywhere, some say there is no scientific basis for it). What I’ve found, through experimenting, is that whether a strain is Sativa or Indica doesn’t matter at all to my body. They both feel about the same. It’s the ratio of THC to CBD is what determines whether I’ll have less pain, and more or less anxiety. A high-CBD strain, that is relatively low in THC, is perfect for me. My favorite strain for this is called Sour Tsunami. It’s actually a hybrid of Sativa and Indica – you’ll notice at most dispensaries that hybrids are flourishing. The ratio of CBD to THC is 15-1 or 16-1, depending on where I get it. It dulls about a third of my fibro pain, and has such an extremely small psychoactive effect, that I hesitate to say it has any psychoactive effect at all. There is no euphoria. If my mind is jumping all over the place, Sour Tsunami will give me a mild feeling of calm, but there isn’t a “high”, in any way. Often I feel nothing at all, except the relief of pain. 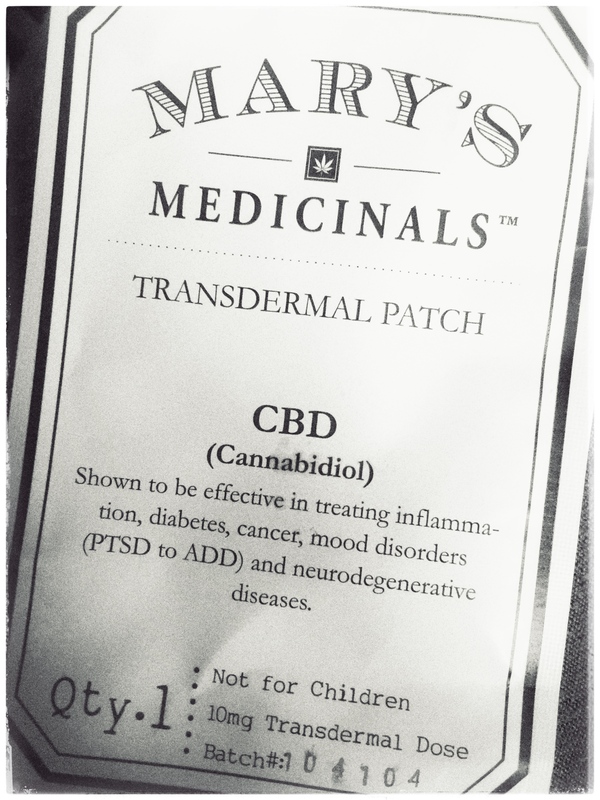 The Mary’s Medicinals patches I’m using are pure CBD. Those have no psychoactive effect whatsoever. And speaking of getting high, my first big Indica trip was….not my favorite thing. A couple weeks ago, I went to the dispensary and met a new employee, a young woman. I was still asking a lot of questions of everyone I met at the dispensary, and when I told her about my anxiety issues, she suggested Master Kush, saying it was an Indica, “so it will be great for sleeping”. She said people used it all the time for anxiety and insomnia. I took her word for it, and didn’t look the strain up, like I should have. I mistakenly thought, “Well, it’s Indica, that means it has low THC.” Nope – Master Kush, as several people since then have told me (usually while smiling knowingly), is “pretty potent stuff”. It has a THC to CBD ratio of about 16-1. It might be an Indica, but it’s chock full of THC. I accidentally took too much – my vape pen didn’t seem like it was working so I kept smoking. I think I got about 4 good-sized hits, and I ended up having an incredible panic attack. Heart rate (as measured by a monitor) was 165 for 5-6 minutes, and then went down to the 140’s and stayed there for another 20 minutes or so. It finally settled down around 110-120, and stayed there for an hour. I laid in bed (I’d tried this experiment late at night, another mistake), and was paranoid as hell until I fell asleep. I had to pee, but wouldn’t go to the bathroom because I was afraid I’d see other faces in the mirror standing behind me (???). At one point I was sure I was having a heart attack, so I began taking my blood pressure with our monitor (it’s worth noting that my blood pressure is very healthy and low normally – 100/60 or 110/70 – and only went up a few points during this trip), but while doing this, began giggling uncontrollably, practically spasming with laughter. I remember struggling to get the BP cuff on while I was laughing so hard. I told my husband that I don’t know why the idea of unicorns with pigtails was so funny, but it just was. This is why careful, slow experimentation is so important for all of you out there like me, who are delicate little flowers. And I don’t mean delicate – I’m a plus-sized person myself. I mean, if you are prone to anxiety and depression, if your nervous system is already raw from chronic pain or other issues, then go slowly. Take one hit of something, then be done for awhile. Go get a glass of water, get comfortable, sketch in a notebook or put on a movie (with positive, upbeat themes). See how you feel before you start taking 2-3 hits of something at a time. And in general, for folks reading this who also might have fibro and/or anxiety issues, I’d suggest starting with a high-CBD strain. Ask your dispensary employees for strains that have a high CBD to THC ratio. It doesn’t have to be as high as 16:1. My other favorite, Harlequin, which I have to be a little careful with but still love, is 6:4. If someone says, “Well this is an Indica, so it will mellow you out and help you sleep,” ask them what the CBD/THC ratio is, and if they don’t know (not all strains have been tested, this doesn’t mean the dispensary is bad), then hold off until you can find a strain that has been tested. Well over half the strains I find have known ratios or chemical profiles, and if you aren’t sure about one, you can look it up on Leafly or THC Finder or any number of other sites. Mary’s Medicinals is a company that makes transdermal patches. It’s a concept most people became familiar with after nicotine patches gained popularity, but transdermal patches are used for all sorts of medications. The patch that I’m using delivers 10mg of CBD over the course of 10-12 hours (although I cut my patch to break up the dose – see below). Mary’s makes other products, including a patch that delivers 50% CBD and 50% THC (I’m going to try that next), but for this post I’m going to concentrate on the CBD patch. I have anxiety issues. After a traumatic event in 2002, I was diagnosed with Generalized Anxiety Disorder, PTSD, and Panic Disorder. That sounds pretty ominous, I know, but overall, it’s okay. I do pretty well. There have been some rough weeks, months, and even years, but as it stands right now, in the spring of 2015, I would describe my anxiety problems as difficult, but not life-destroying. What has been rough over the years is that my my nervous system is reactive, to say the least. In terms of medication, anything new tends to trigger anxiety. My doctor, a kind GP at my local hospital, is aware of this. Whenever she prescribes something new, she starts with a half or quarter-dose, to avoid side effects and/or triggering anxiety. It’s really fun being me. All this is to say: instead of starting with a whole Mary’s Medicinals patch, I started with one quarter. The patch is 10mg, so that means my quarter-patch is 2.5mg of pure CBD. There is no THC, which means no psychoactive effects. The patch begins to work within 15-20 minutes of placement. For the first hour, I can sense it….”loading”? It isn’t a high. It’s a sensation, in my body and in my head, that feels a bit like a very mild brain fog. It’s extremely mild. It causes no significant issues; I can still drive, run errands, etc. I’m guessing most people wouldn’t even have this sensation or any sensation at all, but since I’m Ms. Delicate Snowflake, it happens to me. After 45-60 minutes, the sensation is gone, and I begin to feel continually better, mentally and physically, over the next few hours. The first quarter-patch I tried, I didn’t leave on very long, only a few hours. I placed the patch on my wrist. During this time, it seemed as if my fibromyalgia pain was better, but when my family asked how it was going, I wasn’t willing to commit to any specific result. Maybe I was just having a good day. They do happen. While wearing the patch, I cleaned most of our bedroom, and did some laundry. Normally this level of activity would sap most of my energy for the day. Before I developed fibro, I loved to clean out my drawers or closet by dumping all my clothes onto the bed, sorting them in one grand sweep, and then putting back the items that made the cut, tossing the rest into giveaway bags (I know, it sounds like a book you just read, right?). Since I’ve been sick, I do it differently: one drawer at a time. The key to getting anything done with fibromyalgia is to break big, overwhelming tasks into smaller, low-commitment ones. And yet, while wearing that first quarter-patch, I kept going back to get another drawer. I still felt fatigue and pain. And yet, I just kept going. Something had shifted, I felt like I had more endurance. I wrote down the experience in my notes, but didn’t get too attached to it. After I took the patch off, within an hour, I felt my usual level of pain come back. There again, I noted it, but tried not to attach too much meaning to it. I was able to spend as much time at the beach (2-3 hours) as they were. I wasn’t wiped out, asking to go home, at any point. In fact, I could have stayed longer than we did. Normally a trip like this would wipe me out in an hour or so. I was standing nearly the entire time. I sat down on a log for perhaps 20 minutes, in total. Normally I would be looking for a place to sit down after 10-20 minutes of continuous standing. When we got home, I got out of the car with, still, about 75% less pain than normal. This also never happens. I usually am in a lot of pain coming back to sitting, and then once we get home, turning and getting out of the car and to standing is also very painful and takes me a minute or so to complete. I made the entire trip that day without any significant anxiety. This is also very rare. Fibromyalgia pain is a big anxiety trigger, and an outing like that should have caused a lot of pain. It didn’t, and subsequently, I didn’t have any anxiety. Later that night, I was making tea, and I looked at my husband and said, “Hey, you know what? I haven’t been anxious today. At all. How is this possible?” I felt less hyper-vigilant about sensations in my body. I felt like I had more mental access than usual to calming thoughts. I didn’t feel as anxiously reactive to things. When we got home, we rested for awhile, and then went out to dinner with family, at a crowded and loud restaurant. Normally this would be a very draining experience, especially after an already busy day, but I handled it bizarrely well. I was tired and less talkative than usual, but it was a reasonable level of tired. Normally I would be actively managing a crisis-level lack of energy, through frequent bathroom breaks, anxiety medication, and having to explain to my loved ones my obvious lack of social energy. I would also need to leave before dessert, citing exhaustion. I had to do none of those things. Their discomfort with my unusual level of energy really brought home to me how very unusual it was. They were glad I felt good, but clearly they worried that, despite my seeming so much better, I might really be overdoing it, and suffer the next day. I was curious about this myself, so I decided that at the end of the day, instead of removing my patch after its 12 hours was up, that I’d just put on another quarter-patch, and sleep with it to see how that went. I wore the third quarter-patch all through the night. My sleep seemed deeper than usual, but I wasn’t wearing my fitness monitor so I don’t have any real data. Our dog woke us up at 2:30am coming to bed to sleep with us, and then he woke up again very early to use the rest room. Despite these interruptions, that would normally wreck my sleep and subsequently the next day, I woke up with an unusual level of energy. Normally I wake up feeling like I’ve been hit by a truck. This is standard. It’s also a hallmark of fibromyalgia. That morning, instead of feeling like I’d been hit by a truck, I felt like I’d been hit by a slow-moving bicyclist. I was sore, but I could move. I sat up. I felt into my arms and legs. Everything actually responded back in good time, instead of taking awhile (or on worse days, not responding at all for a minute or so). In the kitchen, while buttering my toast, I began lifting my arms up and down, and doing little squats. My husband looked at me curiously. Within an hour or so, I was feeling a decline coming on. More pain was coming in, I felt very tired, and my hips and shoulders and back felt stiff again. I checked my watch. It had been 13 hours since I put on the patch. The patch is supposed to last 10-12 hours. You can guess what happened next. At this point, I’d worn a quarter-patch for 24 hours, I applied the 4th one for the last 12-hour stint. This day was more mixed. I had an appointment at an office located in the top of a downtown skyscraper. I hate heights, and just taking the elevator up to this place makes me anxious. In several years of coming here, I’ve never not taken Klonopin, an anxiety medication, at some point during my visit. Today, I took nothing. I even left the office and walked down the hallway to the bathroom, without my purse – i.e. my ability to soothe myself if I had a panic attack. In my purse is my phone (to text my husband, who is very helpful during an attack), my anxiety medication, my lucky bracelet, and several other talismans and totems to help me get a grip when I’m unraveling. I’m rarely in a public space without them nearby. Comfortably leaving them even a few rooms away, especially in a place that was anxiety-triggering all on its own, was noteworthy. That said, I did had a mild anxiety attack later in the day. It was hard to tell exactly what triggered it, and my guess is the food I ate at the restaurant the night before; I’m not supposed to eat wheat or dairy, and I had a lot of both. Wheat causes a severe increase in fibromyalgia pain, and both things cause delayed anxiety – usually about 12-16 hours later. So I was right on time. Surprisingly, I didn’t have to take Klonopin to get through the attack. It was mild enough that I just waited it out, another rarity, and it was only 10-15 minutes long – also unusual for me. My attacks can be quite vicious. I was also in more pain than before, but less pain than is normal. I also chalk this up to eating so much wheat, which is a big fibro flare trigger. Mary’s Medicinals CBD patches have a very real, positive effect on my body. My fibromyalgia and my anxiety issues are both about 30% better, which is astounding. I’m going to continue trying a quarter patch, and then eventually will try a half-patch. At $16 a patch, using a quarter-patch every 12 hours, I’m looking at roughly $240/month. If I work up to using a half-patch every day, we’re looking at $480/month. I’ve spoken with my husband about this. He says it’s worth it, and fully supports me continuing. I’ve purchased two more patches, to last four more days, to keep this experiment going. I’ll write up the results of that when I’m done.